This is the second of the two-part ‘My Week in Mauritius’ series. 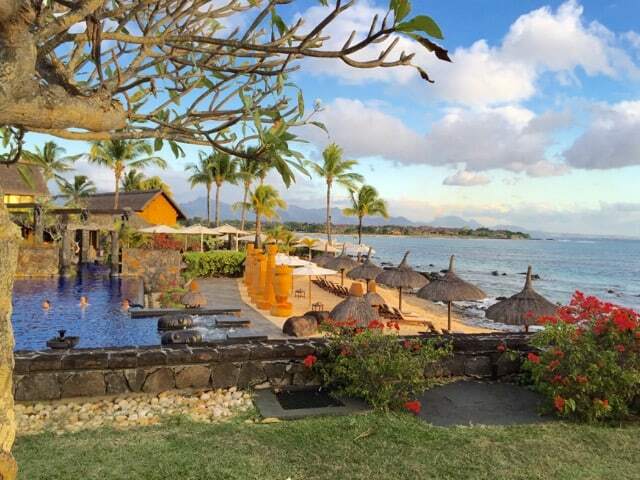 If you missed the first part, head on to My Week in Mauritius – Part 1. The sun was shining bright as I opened my eyes. For a second, I wondered where I was. I pulled the soft duvet over my shoulders and looked around the massive bed. “Oh yes, I’m at the Four Seasons. In the Garden Villa. In Mauritius. This isn’t a dream!”, I said out loud. That thought, and what was in store for me over the next few days, got me scrambling out of that heavenly bed to the back garden where I had a quick shower. There’s just something so invigorating and liberating about outdoor showers. A simple concept but what a great pleasure! I made another mental note: my dream home MUST include an outdoor shower! The bath-tub and outdoor shower in the Garden Villa. The next two days were spent traversing the island with Judex, my guide from Solis. 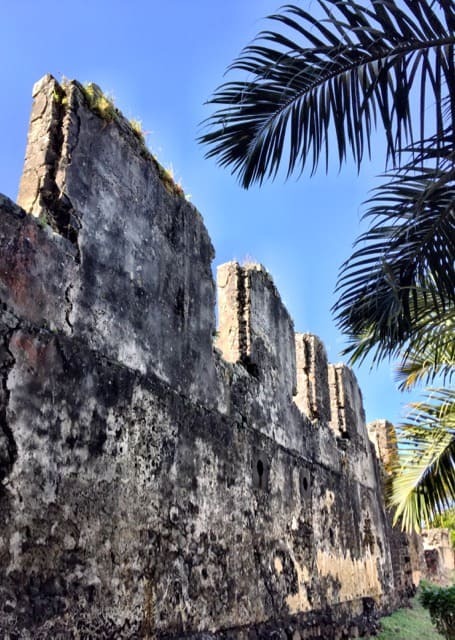 I got to learn more about the often tempestuous history of Mauritius as we passed little towns, old fortifications built by French colonists and mile after mile of deserted beaches. 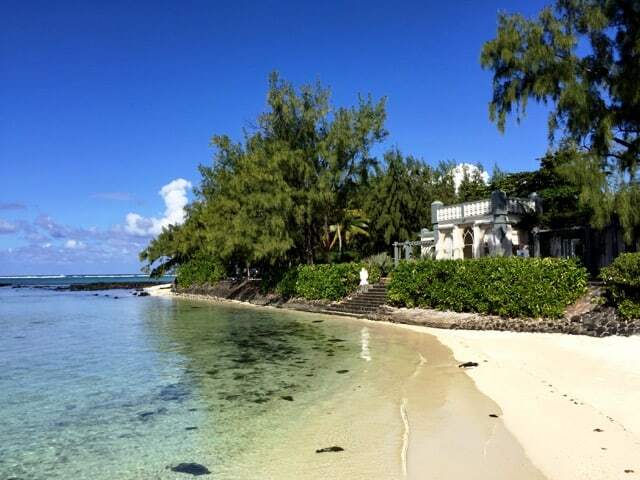 One fact I quickly learned was the origins of the name Mauritius: the first Western settlers were the Dutch who arrived in the 16th century and they named the island Mauritius after the Dutch Governor at the time, Maurits van Nassau. Old Grand Port, the site of the first Dutch settlement on Mauritius. The first day was spent exploring the east and south coast. We stopped at Otentic (a lovely tented accommodation overlooking the Grand River South East) where I had the opportunity to cook with the locals. I made a farata (an Indian pancake) which I then devoured with a dal curry! 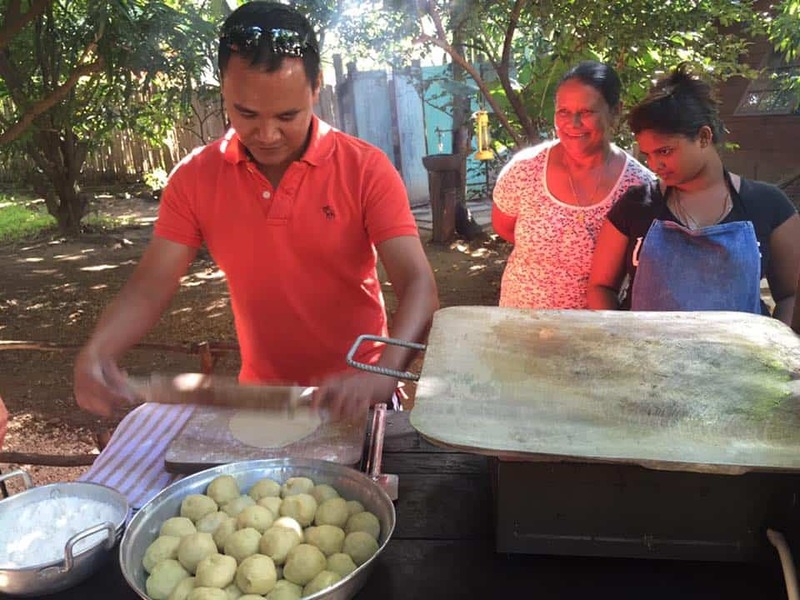 Me making farata with the locals at Otentic. Guess I was doing a good job, judging by that big smile! (image courtesy of Shivya Nath). This lady makes soaps and perfumes from the plants in her garden such as lyang lyang and frangipani. We continued on our trip along the east coast, stopping at a small store owned by a lady who makes her own perfumes and soaps from local plants like frangipani and lyang-lyang, and the historic canons of Devil’s Point before reaching the Pointe Jerome jetty for a boat ride to the Ile Aux Aigrettes nature reserve. The island, made up of coralline limestone, is covered with dry coastal forest and is home to colourful birdlife such as the Mauritius fody and the olive white-eyes, as well as giant tortoises! It was a surreal experience to hike across the island and encounter these giants on our path! The colours of the lagoons never fail to mesmerise! We returned to the mainland and continued down to Blue Bay where we hopped onto another boat. It takes just a split second to realise why it’s called Blue Bay! 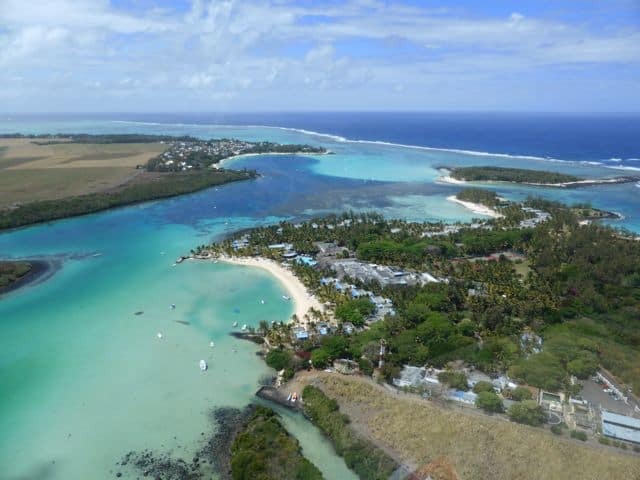 I saw this bay from a helicopter tour during my first trip to Mauritius and it was absolutely breathtaking. Seeing it from the ground was equally amazing! The stunning boat ride brought us to Ile des Deux Cocos, a gorgeous palm-fringed island with a glorious beach! 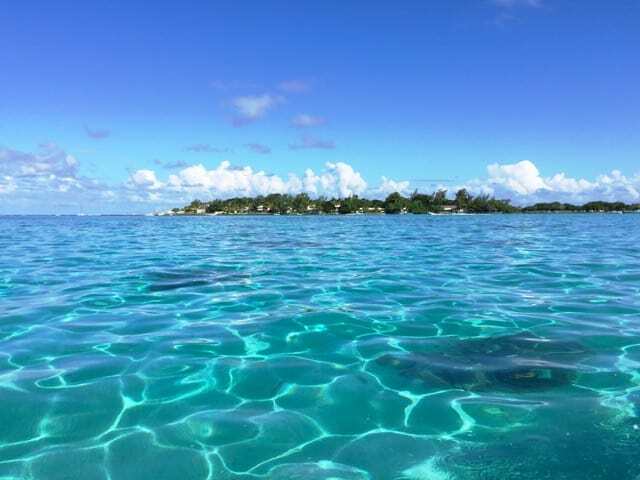 The boat ride over the crystalline water with its different shades of blue was simply mesmerising! After a lovely Mauritian lunch with lots of grilled seafood, I went snorkelling around the reefs with a few of my mates while the others chose to dream the afternoon away in a breezy hammock on the beach. 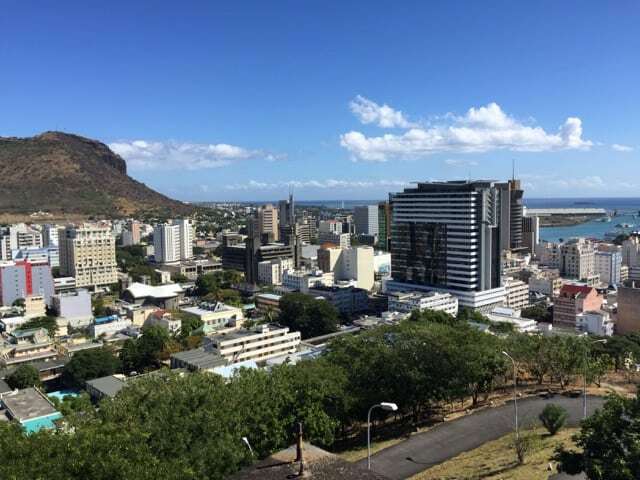 We continued on our road trip the following day, this time from the east coast across the central part of the island to Port Louis, the capital and largest city of Mauritius. Our first stop was the lovely Botanical Gardens in Pamplemousses. 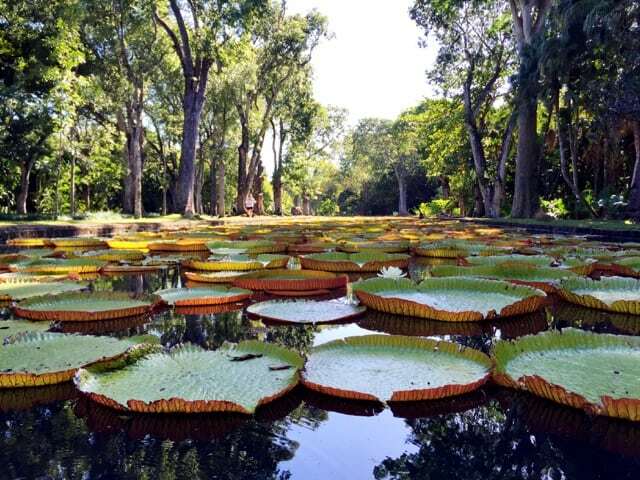 The gardens were created in the 18th century and are famous for its giant water lilies (Victoria Amazonica). The giant water lilies in the Botanical Gardens. We had a wonderful stroll around the gardens but the highlight was definitely the giant water lilies. I approached two men who were busy cleaning the massive pond and pruning the lilies. I looked in amazement as they dragged the huge, leathery leaves out of the water. They looked like giant paella plates! I knelt down to touch one of the leaves and one of the men yelled something at me (in French). I didn’t understand what he said and went ahead to grab one of the leaves; I’m not sure why but I just felt intrigued by its texture. I screeched in pain and the two men chuckled. I hadn’t noticed them before but the sides and bottom of the leaves were covered in thorns that would put a rose bush to shame! I quickly nursed my palm, nodded at the men and murmured, “Je comprends”, before making a quiet getaway. Haha! This gentleman led us around the cane fields at the L’Aventure du Sucre. 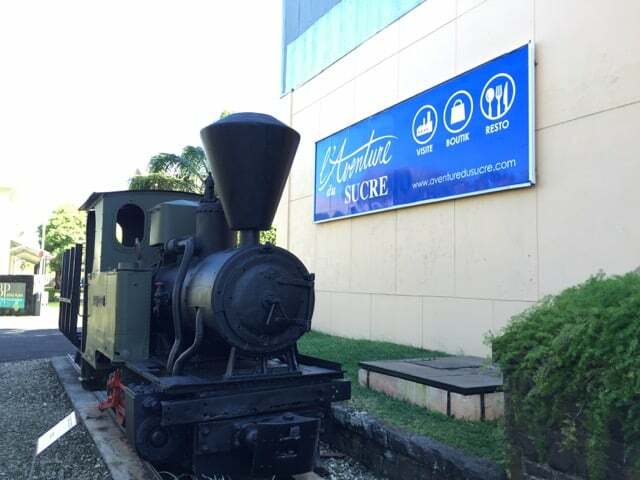 Our next stop was the L’Aventure du Sucre, a living museum dedicated to the colourful history of sugarcane in Mauritius. Sugarcane plantations were created by the French colonists in the 18th century to support a sustainable settlement on the island. Labourers were brought in from India while sugar mills and railroads were built to process and transport the sugar. We toured the museum and the fields where we were invited to cut a few canes. We listened intently as our guide (a cane-farmer himself) told us stories of the labourers back then, the back-breaking hours they spent in the fields and the poor living conditions. The stroll along the cane fields was followed by a rum-tasting in the museum – gosh, that vanilla rum was simply sublime! I hopped into the car with Judex and we made our way to the capital of Mauritius: Port Louis. Our first stop was the Citadelle or Fort Adelaide, built by the British in the 19th century. Situated on a hill above the city, the fort is a great spot for panoramic views of the city, the harbour and the ocean. A panoramic view of Port Louis from Fort Adelaide. 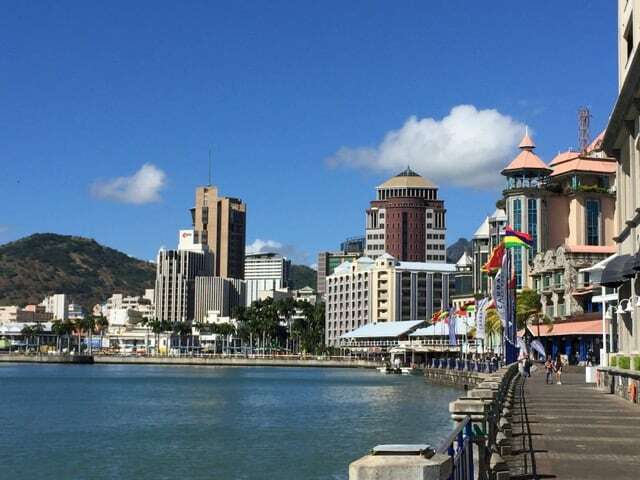 From here, we made our way through the bustling city to the Port Louis Waterfront. 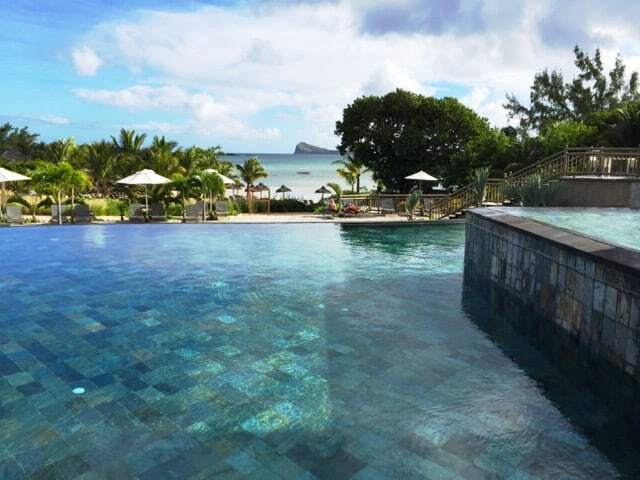 From Port Louis, Judex and I headed north along the west coast of the island to my last accommodation: The Oberoi, Mauritius. The long driveway led to a thatched-roofed tower that reminded me of the Mayan temples in Tikal. There was no one there when we arrived but within a few moments, several hotel staff seemingly appeared out of nowhere to greet me with a welcome cocktail and a cold towel. I was impressed! The little lounge at the entrance to The Oberoi, Mauritius. 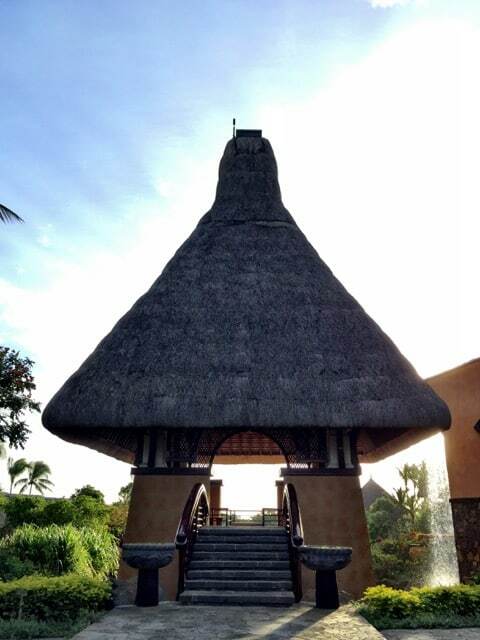 The check-in was handled swiftly in the breezy lounge under the thatched-roofed tower and I was led to my room. We walked past clusters of thatched-roofed villas surrounded by lush, beautifully-kept gardens dotted with sculptures and busts, and reached a thick, wooden door: the entrance of my villa. I opened the door and found a little pathway that wound its way into a gorgeous garden. In one corner, several steps led up to a gazebo and next to it was a stunning private pool. The view of the resort pool and the beach from the garden of my villa. The garden was ringed by a low wall; this ensured privacy and unobstructed views of the ocean. A small gate at the far end of the garden provided direct access to the beach. I opened the glass doors to the villa and entered to find a cozy living area and bedroom. A small passage led to a massive walk-in closet on the left and an equally large bathroom on the right. The sunken bath and shower cubicle faced a small private garden. The villa, nowhere as large as my previous accommodation, oozed a warm, cozy ambiance. In the living area, large glass windows were the perfect frame for the stunning ocean view. I made another mental note: if I ever had a beach house, this would what it would look like! Watch my video tour of the villa below and you’ll see why! Hehe! true bliss at its very best! I went for a quick stroll along the beach just in time to see a spectacular sunset. I stood at the water’s edge and took in the view in silence. I felt exhausted but that soon ebbed away as I felt the cool water curl its way around my toes. It occurred to me (for the umpteenth time) what a magical place Mauritius is. The sunset that evening at The Oberoi, Mauritius. Back at the villa, I decided to go for a swim in the garden pool before curling up on the deck-chair with a glass of wine and some delicious hors d’oeuvres. The starry sky appeared soon enough and I stayed in that chair in the garden for the rest of the evening, listening to the waves and looking up at the Milky Way ever so often. This was true bliss at its very best! Judex met me the next morning and we drove up north to the Zilwa Attitude resort where I caught up with my travel mates. The resort is composed of a maze of pools surrounded by low-rise buildings with incredible views of the azure lagoon, and fringed by a blindingly white beach. One of the pools at Zilwa Attitude and the fabulous view! 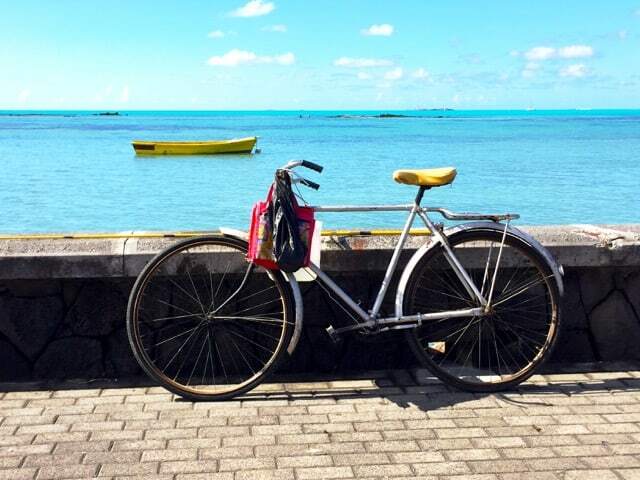 After a quick walk around the resort, we were taken on a bicycle tour past sleepy fishing villages and lagoons with colourful fishing boats bobbing up and down on the crystalline water. We cycled past lagoons and sleepy villages. Street art in a village we passed. I stopped at a small market and bought a few jars of spicy chili sauce (I absolutely LOVE chili sauces from the Indian Ocean islands!). The local rhythm in this corner of Mauritius was visibly different (i.e. slower). I smiled as I waited patiently to pay for the sauce while the lady behind the counter engaged a customer in a rather animated chat. She cheerily said goodbye to her customer and turned her attention to me. My French is basic (at best) but we understood each other as she quizzed me about where I’m from and what I was doing in Mauritius. She laughed as she warned me about the ‘power’ of the chillies. “C’est délicieux!”, I exclaimed as I picked up my jars of chili sauce. She nodded in agreement and waved me goodbye. Back at the Zilwa Attitude resort, we headed down to the beach where we hopped onto a pontoon that took us to a small island in the lagoon. 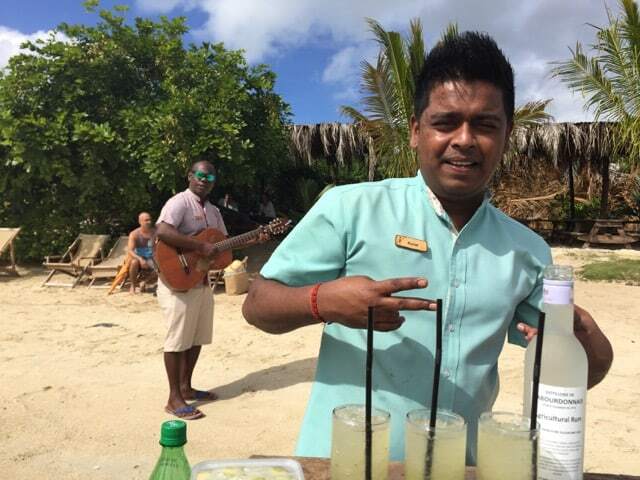 We were greeted on the beach by a jovial gentleman playing a guitar and another with rum cocktails on his tray. Fabulous! We had a fun afternoon on the island, feasting on local dishes, sipping on cocktails and simply lounging on the beach. A fun welcome on the island of Zilwa Attitude! I returned to the Oberoi, Mauritius in time to witness my final sunset on this trip. I watched the sun slowly dip under the horizon before making my way to the resort’s Spa for one more massage. I had a 12-hour flight back to London ahead of me and I figured this was the perfect thing to do before the flight. And it was! The massage was terrific and I felt energised for the long trip home. The Spa at The Oberoi, Mauritius. I just come back from 3 weeks Maldives trying out the most amazing resorts see my Instagram @traveltomtom. Reading this is exactly what I experienced. I cant wait to explore Mauritius, thanks for the inspiration!